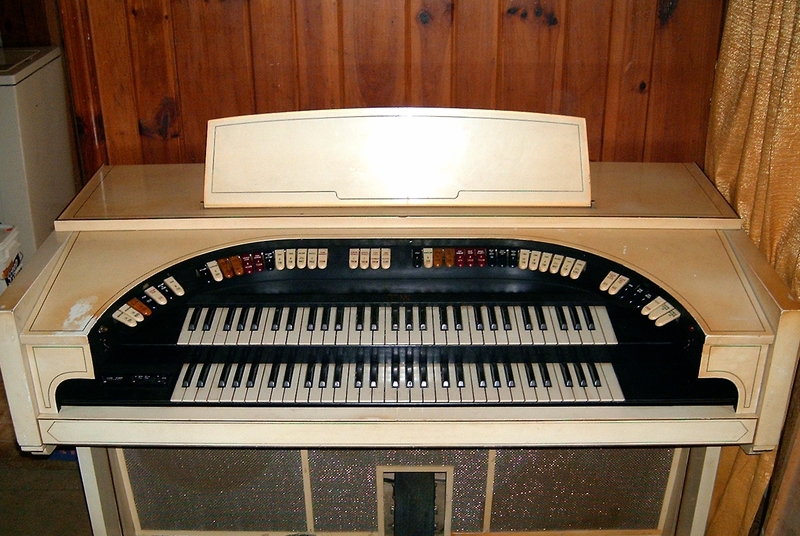 1964 Conn Model 640 Vacuum Tube Theatre Organ. 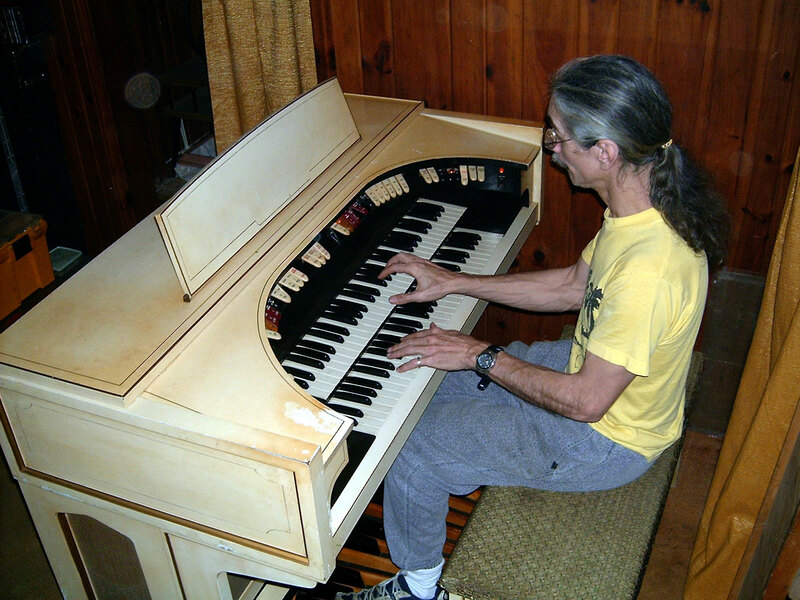 Back in the seventies, the Bone Doctor demonstrated electronic organs for Tommy Covington during the final days of the great Home Organ Boom. There were Lowrey, Thomas, Baldwin, Gulbransen, Hammond, Kimball and Farfisa instruments to show off, from small spinets to huge concert models. The Bone Doctor got to play them all as the crowd looked on. Many were sold to happy buyers looking for that sound to put in their homes. Of all these organs, in the Doc's humble opinion, the big Conn Theatre Organs stood out above all the rest as the ones that sounded like the great pipe organs in the movie houses. In those days, Doc was very poor and owning one of those fine instruments was only a dream. He was just sixteen years old the first time he got to play one. It was an experience he would never forget. After many years of training at college and later in the field, Doc learned how to service personal computers. One of his life-long friends, Sue Rose, who owns a music store known as Rose Music Company, called him up. Her music store in Louiseville, Tennessee had an office computer that needed fixing. Doc went out to get it, and upon putting the machine on his workbench, found it to be totally unrepairable. So, Doc built a new machine from parts he had on hand and took it back to her. She had no money at the time for payment, but she did have an old Conn 640 Theatre Organ in the back room she wanted 200 dollars for. This was, coincidentaly, the repair fee levied for the computer Doc built. A trade was negotiated: the organ for the computer. Sue had stated that this organ was the ugliest thing she had ever seen (Sue loves Rodgers and Hammond), and she would be glad to get the behemmoth out of her store. Gleefully obliging her, Doc hauled it home, the fullfillment of a thirty year old dream. the beautiful vintage Conn 640 Vacuum Tube Theatre Organ. When Doc got the instrument in his house using a dolly with the organ on its end, he found it to be very dirty and largely nonfunctional. What did work was horribly out of tune. There was a broken stop tongue in the Accompaniment at Diapason 8'. He glued this back together. None of the Tibias would sound. Most of the other stops were iffy all over. He lifted the horseshoe lid and removed the back cover panel. There were dust bunnies and rust motes everywhere. He cleaned everything. This took lots of patience, Deox-It and hard work. Eventually, all the keys played notes everywhere except in the Tibias. Doc needed help. He called his buddy in Newport, Bob "Finge" Burgess of TekTrax Computer fame. Now, Bob can fix anything, given enough time to dose it out. When Bob arrived, he was armed with a precision voltmeter and a dual trace oscilloscope. We had no schematics. Being a tech aboard a B-52 during the years of his service in the military, Bob knew much and, within about six hours, found all the faults in the organ. We were impressed, indeed! There was a bad capacitor stopping the Tibias from sounding. We were able to get a replacement capacitor from Radio Shack. There was a bad PC Pack in the keyers, causing a cipher at high B in the Solo Tibia 4', which we obtained a replacement for at Organ Service and Supply. The organ now sounds new, although it has many battle scars. with the console lid raised up for servicing. The first thing to do was open the console by removing the back cover panel and raising the horseshoe lid. In the picture above, we see the lid and the underside of the stop rail and then, the innards of the keyer box and the manuals. Notice the oscilloscope perched near the end of the console with attendant probes lying about. This tool was a life saver for finding circuit traces and spotting the loss of signals. 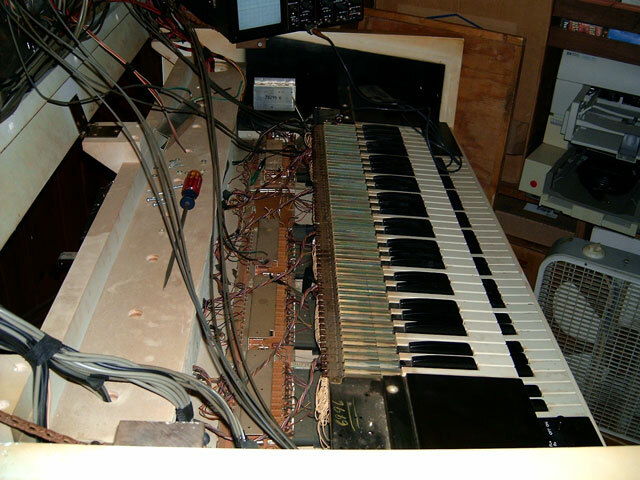 The pedal clavier has been removed and the bench set aside, not visable in this view of the workspace. Out of the view but near the left end of the solo manual is a small metal box which contains the Tibia coupling stage. This is where the faulty capacitor was found. The capacitor was not visually damaged and a voltmeter gave no indication it was bad but the 'scope found it when a signal was applied. As soon as this capacitor was replaced, the Tibias sounded when keyed. What a glorious tone they made! This was the easy part to fix. The hard stuff was yet to come. One of the Tibia notes was hanging. What is known in the TPO world as a "cipher" was occurring. Here, we see a close up of the area where the faulty keyer was found. 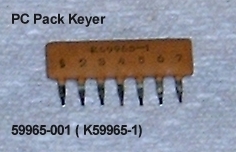 Along the backside of the solo manual, there are five keyer networks covered with metal sheilds. By looking at the keyer neon lights as stops were drawn and notes were played, we found the faulty keyer. Many tiny wires had to be unplugged to get the unit out. Fortunately, these wires were color coded, and the adjacent unit connections matched. After removing the faulty keyer, it was a simple matter to apply a signal and scope it out. The signal stopped at a small seven legged ceramic package called a PC Pack. Bob removed the part and looked for a number on the part. Doc, having travelled all over the cyperspace part of TPO land, knew of Organ Service and Supply in Indiana. Having bookmarked the page, he simply went to the site and looked up the part number, which was in stock. A quick telephone call to some very friendly and helpful folks there accomplished an easy purchase. Three days later, the part arrived. 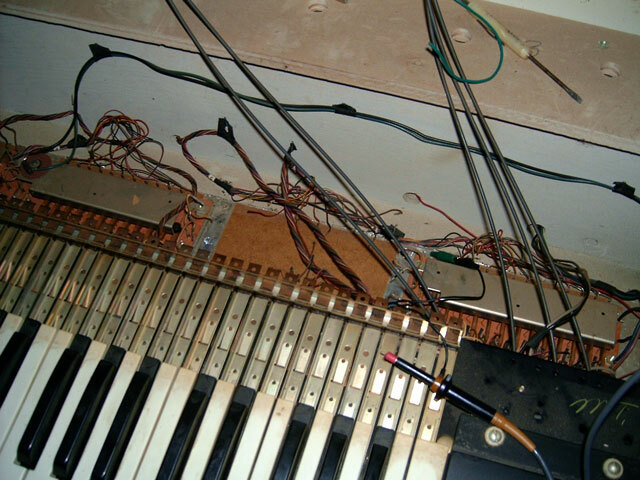 As soon as the part was installed, and the keyer put back in with the wires all plugged up, the cipher went away and the organ rang out on all its stops. The Leslie was louder than the straight channel and the pedals were weak. Tweaking some trimmer potentiometers here and there brought the tones inline and the organ began to make wonderful music as Doc cheerfully noodled about on her keys. He finally had a machine he could practice on! Here, we see a close up of the number five keyer board with the faulty PC Pack removed. This is the assembly that brings the signal from the bussbars to the summing stage, one of five in the organ. Each of the five octaves in the tone generator gets a keyer board. Notice all the little hollow rods sticking up, each one having a colored wire that goes in the rod. 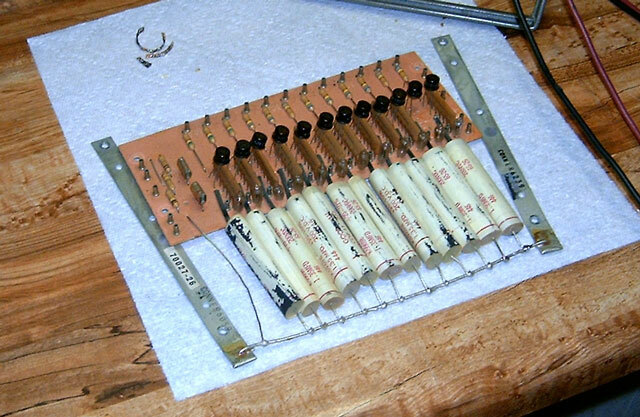 There are germanium transistors and neon lights, along with capacitors and resistor packages on the board. These packages, known as PC Packs, are the first thing the signal sees after leaving the buss. There are twelve on each keyer board. The eleventh one had a short in it, causing high B below high C to be stuck on. Even when the Tibia 4' stop was cancelled and no key pressed, the note continued to hang, or cipher. keyer board PC Pack, number eleven of twelve. Ah, yes. Here is the culprate. Notice the seven legs on the package. In the organ, there are bussbars that run between the stacks of keyer tines below the keys. There are seven bussbars on the solo manual. Each leg on the PC Pack goes to one of these bars. There is a package for each note in the musical scale. This package controls the B notes. There are 47 AGO Spec Stop Tongues in the horseshoe surrounding two 61-note AGO manuals. There is one swell shoe above the 25-note flat radiating pedal clavier. On the left end of the stop rail is a small rotary switch for the stop rail lights that has three positions: On Low, On High, and Off. On the right end of the stop rail is the main power toggle switch and pilot light. On the left end block of the Accompaniment manual can be found the percussion and reiteration controls. The console has a stereo 35-watt per channel vacuum tube power amplifier driving a 10-inch two-speed Leslie and a straight channel with a 15-inch woofer, 12-inch full range, and 6x9-inch full range with a whizzer cone for the highs. There is a six-pin Amphenol connector for external speakers on the back panel. All the internal loudspeakers are made in England by Celestion. These are fine loudspeakers that have amazing audio bandwidth and loudness. Inside, there are trimmers for the Main, Tibias, Lower Pedal Octave and Upper Pedal Octave. There are also tuning trimmers for the 25 pedal notes. Reverboration is provided by a bucket brigade circuit in the Tibia channel. The console is made of solid walnut and painted antique white with gold leaf trim. The bolster and end blocks are matte black. There is a matching bench with a music compartment and hinged, padded lid. The whole assembly weighs about 600 pounds and draws over 300 watts of power. It also gets quite warm after a time. The sound is fabulous and very authentic, concidering the time period in which the organ was built. Origanally, it cost 4,000 dollars. Today, it is worth no more than 300 dollars, but it is priceless to the Bone Doctor! Mighty Conn 640 Vacuum Tube Theatre Organ. Below is a list of nineteen tunes the Bone Doctor recorded on his Mighty Conn 640 Vacuum Tube Theatre Organ. Eleven were done in the middle of the night on December 8th, 2005 and five more were done on the evening of the 9th. Three more were done in the evening of the 14th. The rest were done the following week. The recordings were made using two Shure PE-48 microphones feeding an Electrovoice/Dynacord mixing desk connected to the line in on the main data server soundcard running SoundForge 6. There was no EQ during the recording. The mics were about 2 feet from the speakers and you can hear the pedals clacking because of worn out felt. During the post edit, there were Sonic Foundry Noise Reduction and Normalization along with Waves Q10, MaxBass, and TrueVerb applied. Windows Plus! Audio Converter was used to convert the WAV's to 128KB/sec WMA's. Playing time = 3:53, file size = 3.60MB, bit rate = 128KB/sec. Playing time = 2:27, file size = 2.27MB, bit rate = 128KB/sec. Playing time = 3:20, file size = 3.09MB, bit rate = 128KB/sec. Playing time = 3:10, file size = 2.95MB, bit rate = 128KB/sec. Playing time = 5:01, file size = 4.64MB, bit rate = 128KB/sec. Playing time = 2:49, file size = 2.62MB, bit rate = 128KB/sec. Playing time = 4:48, file size = 4.44MB, bit rate = 128KB/sec. Playing time = 3:57, file size = 3.65MB, bit rate = 128KB/sec. Playing time = 4:04, file size = 3.77MB, bit rate = 128KB/sec. Playing time = 3:33, file size = 3.29MB, bit rate = 128KB/sec. Playing time = 2:50, file size = 2.63MB, bit rate = 128KB/sec. Playing time = 4:24, file size = 4.07MB, bit rate = 128KB/sec. Playing time = 3:34, file size = 3.30MB, bit rate = 128KB/sec. Playing time = 3:35, file size = 3.32MB, bit rate = 128KB/sec. Playing time = 2:28, file size = 2.29MB, bit rate = 128KB/sec. Playing time = 3:31, file size = 3.25MB, bit rate = 128KB/sec. Playing time = 4:26, file size = 4.10MB, bit rate = 128KB/sec. Playing time = 3:28, file size = 3.21MB, bit rate = 128KB/sec. On the afternoon of December 15th, Tom Hoehn stopped by the Walnut Hill Recording Studio and gave Gabbie a go, playing almost a half hour of great Christmas music. The session started of with some music other than holiday tunes, but the Christmas tree sitting on the console must have infected Tom with the Yuletide spirit, for it wasn't long into the medley that he got going for Santa! I just wish we had a camera available to take pictures of the event. We fired up the recorders before he took the bench, and the results are available below for your enjoyment. Gabbie is quite old and her tubes are getting gassy, so you will hear some crackling going on here and there that we could not remove. Still, Tom made the old gal sound grand, indeed. Playing time = 27:52, file size = 38.40MB, bit rate = 128KB/sec.